What are the different types of clinical seizures? Are seizures bad for children? Who is a candidate for epilepsy surgery? What tests are used to determine if a child is a candidate for epilepsy surgery? Who performs pediatric epilepsy surgery? What are the types of epilepsy surgery? Pediatric epilepsy surgery can be used to treat a highly selected group of patients whose seizures are not controllable by standard means. The appropriate candidate for epilepsy surgery must meet several criteria. There are currently three major categories of epilepsy surgery: resective surgery, corpus callosotomy, and implantation of the vagus nerve stimulator. In patients that meet the requirements for epilepsy surgery the results, in terms of seizure control, can be very positive with minimal side effects and complications. An epileptic seizure is a sudden and transient occurrence of signs and/or symptoms that are the result of an abnormal activity of the brain. Epileptic seizures are the common and defining component of the disorder that is referred to as epilepsy. The diagnosis of epilepsy implies that there is an abnormality in the brain and that this abnormality will result in more epileptic seizures. That is, an individual that has an isolated seizure as a result of an acute transient insult to the brain, for example a metabolic disorder, or a seizure observed after an acute trauma to the brain, would not be diagnosed as having epilepsy. In other words, epilepsy is the tendency to have repeated spontaneous seizures. There are different types of seizures, which traditionally have been categorized as either generalized seizures or partial seizures. Generalized seizures are those in which the clinical manifestations indicate that the whole brain is involved from the beginning of the seizure. Partial seizures (local, focal) are those in which the epileptic event is limited to one part of the body or to a particular function of the brain, indicating that the epileptic seizure started in one limited area of the brain. Partial seizures may remain focal or may expand to the rest of the brain. When seizures expand to the rest of the brain these are referred to as secondary generalized seizures. Consciousness is always impaired in generalized seizures; however, in the case of partial seizures consciousness may be preserved , as in the so-called simple partial seizures, or it may be impaired, as is the case with the complex partial seizures. Among the generalized seizures, the generalized tonic clonic seizure (traditionally recognized as a grand mal seizure) is the most common type. In this seizure there is a succession of muscle contractions (tonic component), more obvious in the extremities but affecting almost every muscle of the body, followed by sudden relaxation (clonic component) and further followed by another tonic component. This succession of events is repeated several times. Simultaneously, there are other signs and symptoms including dilatation of the pupils, increased heart rate, and increased blood pressure. Cyanosis (skin and lips turning blue-purple) is also seen due to persistent contraction of the diaphragm muscle and holding of the breath. These convulsions are usually followed by a period of confusion. In most instances these seizures, as well as most of the epileptic seizures, last for a few seconds or at the most for 2-3 minutes. Occasionally the seizure event may be prolonged, lasting several minutes. By definition, when the event lasts more than 30 minutes, it is described as status epilepticus. Another type of generalized seizure is the absence seizure, also called petit mal seizure, because the clinical symptoms are not as dramatic as with the generalized tonic clonic seizures. In the absence seizures, as the name implies, the patient looks absent, like "not being here." With this type of seizure there is a sudden interruption of activities, and the patient becomes unresponsive. Usually these seizures, particularly when they last longer than a few seconds, are associated with other subtle clinical signs such as eye blinking or twitching in the face or upper body. There is almost no confusion after these seizures, and the patient returns to his/her activities without even acknowledging that a seizure has occurred. In the atonic seizures (drop attacks) there is a sudden loss of muscle activity, like a sudden paralysis. The patient will collapse like a marionette when all its strings are cut at once. If these seizures happen when the individual is walking, a fall will result, or if the patient is seated, he/she will experience a sudden drop of the head, usually without the motor reflexes that help people to prevent injuries. These seizures are very brief and might result in serious injuries, most often to the forehead, mouth, and/or face. The myoclonic seizures consist of rapid, jerky contractions of isolated muscles or group of muscles which may or may not result in body movements. The tonic seizures consist of a brief stiffening of the muscle groups, resulting most often in extension of the arms or legs or arching of the trunk. Some of these seizures might be associated with a forced exhalation of air, due to a sudden contraction of the expiratory muscle through partially contracted vocal cords, resulting in a loud sound. With partial (focal, local) seizures, the clinical events originate in a limited area of the brain. The clinical manifestations depend upon the area of the brain that is abnormal. Many different clinical events can be seen with this type of seizure. For example, with simple partial seizures (consciousness is not impaired) if the focal area of the brain involved is the motor area, the patient might have rhythmic contractions in one arm or leg. If the areas compromised are more involved with the visual system then the patient might complain of visual illusions. a sense of "déjá vu,"
These patients are conscious when the symptoms occur, and their description of the symptoms can be very useful in determining which area of the brain is involved in the seizure. This has important implications for the selection of the appropriate treatment, especially for the decision about the need for surgery. The complex partial seizures (sometimes called "temporal lobe seizures" or "psychomotor seizures"), in which consciousness is impaired, have a greater range of symptoms. The symptoms already described in the simple partial seizures might be present and might be followed by complex automatic behaviors such as manipulating objects, walking around the room, or answering questions, usually done in a rumbling, difficult-to-understand language. I have always wanted to be the mother of a large family. My husband and I were looking forward to having a house filled with the laughter of many children. When our second child was diagnosed with a serious, debilitating illness called infantile spasms, it seemed that our dream would be dashed. Eliana was born in 1992 and a sibling for her big sister, Tovah, who was 2. Eliana was a gorgeous, happy baby, and my husband, Frank, and I were over the moon enjoying her. She smiled early and gazed at us with her big, blue eyes. Her smile and her eye contact were two things we would lose in the coming months. When Eliana was 4 months old, she started to cry a lot. We should have known better than to write the crying off as colic. Colic normally ends at 4 months old, not starts. There is a strange phenomenon called denial. It could not be possible that something was wrong with our beautiful baby. Those strange little movements she was doing were surely due to a baby's immature neurological system. All babies made odd little movements, didn't they? We had no idea we were looking at something extremely serious. At six months Eliana had still not rolled over or used her hands. She continued to cry and scream and make the odd movements. Denial was over. Something was wrong. We could no longer say "She'll roll over tomorrow. Give her time." The morning of her appointment with her pediatrician Eliana was sitting in her baby seat and she had a series of the movements in a row. Her eyes rolled back in her head and she let out a shriek. This was the worst I had ever seen and I was terrified. My husband and I both went to the pediatrician. The doctor put Eliana on the examining table and lifted her up by her arms. Eliana's head flopped backward and the pediatrician said, "Her head control is terrible." I heard nothing after that. I left the room and went into the hallway where I leaned against a wall and cried hard. Many different disorders of the brain may be associated with epilepsy. For some patients the epileptic disorder is congenital, that is, the child is born with the predisposition to have epilepsy. In other patients, the epileptic disorder is acquired because of brain damage that occurred after birth. The congenital epilepsies could be the result of the child having a gene that is responsible for the epileptic disorder; these are the genetic types of epilepsy. Alternatively, congenital epilepsy may be the result of factors that interfere with the development of the brain during gestation, resulting in brain malformations. In acquired epileptic disorders, the damage might occur at the time of birth, for example the case of newborns that have oxygen deprivation during labor and delivery; or intracranial bleeding, as seen in some children born prematurely. Also, the brain damage may occur any time after birth. For example, epilepsy could be a complication of infections in the brain (meningitis, encephalitis), head injuries with brain damage, brain tumors, or intracranial bleeding. Presently there is no indication that short-lasting seizures will result in any brain damage. 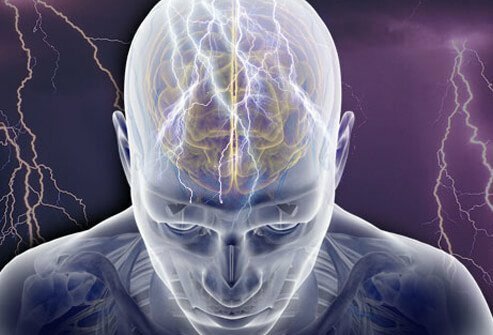 However, prolonged seizures, especially generalized tonic-clonic seizures, in some cases could result in brain damage, but this is very unusual. Although brain damage is not likely, children can be injured at the time of the seizures. For example, in the atonic seizures there is a sudden loss of muscle power and, if this happens when the patient is standing, it is followed by a fall that might result in injuries to the face and/or mouth. Similar types of physical injuries can happen with other seizures. The main line of treatment is with antiepileptic drugs, which are effective in controlling seizures in 70%-80% of patients with epilepsy. There are several antiepileptic medications. Since certain medications are much better for some seizures, the choice of the medication should be made by a physician who is familiar with these medications. If possible, the child should be evaluated in a center specializing in epilepsy. If this is not feasible, usually pediatric neurologists have training in epileptic disorders and are a good source for a referral. When antiepileptic drugs fail to control the seizures, the patients may improve with surgical procedures. Surgery is indicated in a small group of children. Since surgical procedures might be very effective in some children, once it is clear that the child's epileptic disorder is not responding to treatment with antiepileptic medications, surgery should be considered. Young age is not a contraindication for surgery, and there is no benefit in waiting for the child to be older. In fact, there is considerable evidence that the younger a child is at the time of surgery, the better his/her potential will be for good function after the surgery. There is a certain degree of plasticity in the brain that helps with the recovery of functions that can be damaged at the time of surgery. This plasticity is higher in younger than in older children. As previously mentioned, surgery is only preferred once it is clear that the child is resistant to or does not respond well to antiepileptic medications. Many tests are used to make this determination. Electroencephalograms (EEG) are very important in determining the type of epileptic seizures as well as the area of the brain that is responsible for the seizure disorder. When the routine EEG (usually one hour long) does not give enough information, the child might need to be hospitalized (usually in special EEG wards) for a prolonged EEG with video monitoring. During the hospital admission (which may last several days) the EEG is recorded continuously throughout the entire day. The goal is to record epileptic events for further analysis. In some children it is necessary to stop the antiepileptic medications while the child is in the hospital to facilitate the emergence of an epileptic event. Neuroimaging studies are very important to help determine the presence of brain lesions. A CT scan and an MRI, in some cases, might be helpful to point to the specific area of the brain that is abnormal. These tests are very effective to identify developmental abnormalities, brain tumors, scars due to prior bleeding events, or the presence of vascular malformations that might be responsible for the epileptic seizures. In some children, functional MRI (fMRI), positron emission tomography (PET), single photon emission computed tomography (SPECT), magnetoencephalography (MEG), or ictal SPECT (an SPECT obtained at the time of the epileptic event) might also be indicated in order to determine the area of the brain to be excised. In some cases the localization of the epileptogenic area requires invasive monitoring. In these children, electrodes that record the brain activity are placed either inside the brain (intracerebral electrodes) or directly on top of the brain (subdural electrodes). This procedure may be done at the time of the surgery or days before, in which case it requires a small operation and admission to the hospital for several days for continuous EEG recording. Resective surgery (removing specific areas of brain tissue) may result in functional deficits. The functional deficits relate to the area of the brain involved in the surgery. For example, operations near the motor area might result in motor paralysis; surgery in the posterior area of the brain (the occipital lobe) might result in visual deficiencies. Of particular importance is the surgery that is performed in or near the temporal lobe which, among other functions, is responsible for language comprehension and memory. In such cases a special test, called the WADA test, is performed to ensure that removal of the local lesion does not result in severe memory or language functional deficits. Once the evaluation is completed the team will decide if the patient is a viable candidate for surgery and in that case, what type of surgery is indicated. It is worthwhile to mention that not all of the above-mentioned tests are necessary in all patients. The actual surgery is performed by a neurosurgeon with specialized training and experience in pediatric epilepsy surgery. However, prior to the surgery the patient must be evaluated by a team of epileptologists, neuroradiologists, neuropsychologists, and neurosurgeons with specialized training in patients with refractory epilepsy. Most of these teams are in large academic medical centers with affiliations to medical schools. The team will tailor the surgery for each child on an individual basis. The following are the surgical interventions that are performed to control epileptic disorders. These procedures can be done directly on the brain, (resective surgery or corpus callosotomy), or by implanting a stimulator of the vagus nerve in the neck (vagal nerve stimulation). In resective surgery the part of the brain that causes the seizures is removed. In corpus callosotomy the major connection between the two sides of the brain is severed (cut). Vagus nerve stimulation is a procedure in which a small wire is attached to the vagus nerve in the neck. This wire is used to electrically stimulate the vagus nerve. Resective surgery is the best indication for those children with epilepsy that is resistant to the antiepileptic medications and in whom a focal area of the brain was identified as the cause of the seizures. Most of these children have focal seizures rather than generalized seizures. In this procedure, the portion of the child's cerebral cortex that is causing seizures is removed. In some children the epileptic area is restricted to one discrete area of the brain, for example the temporal lobe; in other children several areas of the brain might be involved. The type and the extent of the surgery depends upon the size and location of the epileptogenic area. When the lesion is very discrete, a small area of the brain might be removed, a procedure known as partial lobectomy. If the lesion is more extensive, the child might need a bigger resection, known as multilobar resection. In some extreme cases a full half of the brain might need to be removed, known as a hemispherectomy. Since resective surgery will result in the elimination of an area of the brain that might still be functioning before the operation is performed, it must be determined that the area in question can be removed without unacceptable problems, such as a loss of language capacity or a severe motor (movement) insufficiency. In some children resective surgery could be the most effective form of treatment. For example, in children with mesial temporal sclerosis, a condition in which there is a well-localized lesion in the temporal lobe, the resection of the lesion can result in up to 80% of patients being seizure-free. Fifty percent of children with extensive malformations involving one hemisphere may be seizure-free after hemispherectomy. In general, for the selective group of children with well-localized lesions, resective surgery will be beneficial in most of them. The corpus callosum is a structure composed of nerve fibers that allows for communication between both sides of the brain. Corpus callosotomy consist of cutting the corpus callosum. In partial callosotomy, one section of the corpus callosum is cut, whereas in total callosotomy the whole length of the corpus callosum is cut. Since the fibers that go from one half of the brain to the other half are cut, the communication between the two halves of the brain is impaired. This is precisely the goal of the callosotomy. By limiting the communication between the two sides of the brain the callosotomy prevents the rapid spreading of the epileptic event from one half of the brain to the other. The indication for this operation is rather limited, mostly to children who have frequent drop attacks, and at the present time is not frequently performed. The vagus nerve is a nerve that connects the brain with several internal organs such as the lungs, heart, stomach, and other organs. Stimulation of the vagus nerve sends information to the brain. Studies have shown that electrical stimulation of the vagus nerve results in an inhibition of seizure activity. However, the reasons for this improvement are not clear. The vagus nerve stimulator (VNS) is a device that consists of a wire attached to an electrical stimulator. The wire is wrapped around the left vagus nerve in the neck, and the electrical stimulator is implanted in a pouch under the skin in the upper chest. The stimulator is programmed to send electrical signals continuously. The strength and the frequency of the electrical stimulation is adjusted as needed by professionals with special training in this technique. Additionally, the system has a magnetic hand-held device that can be used by the patient. Patients who can recognize the beginning of their seizures, for example those who have auras, can use this device to activate the system and abort the seizure. Also, since the stimulator can be activated at any time, if needed, it could be useful to shorten long-lasting seizures and also in the prevention of status epilepticus. VNS seems to be effective in a variety of seizure disorders and epileptic syndromes. It has also proven to be effective in epileptic disorders that are resistant to antiepileptic treatment. Studies show that in many individuals with refractory seizures, VNS significantly reduced seizure activity, and some people have been rendered seizure-free. VNS is indicated in children with epileptic disorders resistant to medication that are not candidates for surgery. In the USA, VNS is approved for children older than 12 years of age; however, there is no age limit in the European Union. What are the risks of VNS implantation? Potential side effects of VNS implantation are those from general anesthesia, the failure of the implant to work and infection at the implant site. Additionally, stimulation of the vagus nerve may cause hoarseness, coughing, and may even change the heart rate. Because the VNS is implanted outside the skull, there is little possibility of additional neurological damage. Some of the risks associated with epilepsy surgery are related to the presurgical evaluation. Some of the tests performed require the use of contrast material that might result in severe allergic reactions. Implanting electrodes in the brain or placing electrodes on the surface of the brain for continuous monitoring requires surgical procedures that are not very complicated but may be associated with bleeding or infections. Many tests, as well as the different surgical procedures, require the use of heavy sedation or general anesthesia. General anesthesia has a very small risk of death. There are several risks inherent to the surgery, for example, bleeding inside the brain. Bleeding inside the brain might result in additional brain damage, besides; the accumulation of blood might increase the pressure inside the cranium resulting in severe complications, including death. Also the operation may be complicated by infections that can result in meningitis. A later complication of these events could be the development of hydrocephalus, which may require another surgical procedure. As described before, resective surgery implies the removal of a piece of the brain that in some instances could be as much as the whole hemisphere. This resective surgery may aggravate prior functional deficits or may result in new ones. These complications may occur even after very careful evaluation. operations near the cortical visual areas might result in visual deficits. In the particular case of the callosotomy, since there is some degree of disconnection between the right and the left side of the brain, besides the complications already mentioned, some annoying subtle deficiencies may be experienced. For example, some patients may be able to identify, by visual recognition, objects presented to one side of the brain, but might not be able to name them because the memory of the name is in the other side of the brain. In general there are fewer complications with callosotomies than with resective surgery. Yet, as in the case with all surgeries, there is always the risk of failure. In the case of epilepsy surgery this means recurrence of the epileptic seizures after the operation. Depending upon the type of pre-existing lesion, the failure rate may be as high as 50%. However, even in these cases, the seizures may be easily controlled with medications after the surgery. In general there are very few complications observed after surgery. A small percentage of children who have had epilepsy surgery experience complications, and even fewer have neurological complications. Mortality (death) is very rare. As previously mentioned, there is plasticity in the brain of young children, mostly up to the age of 7 to 9 years. The plasticity helps in the recovery of deficits that can be the result of surgery. For example, for children in whom the language areas were affected by the surgery there is remarkable recovery of language functions. Therefore, young children with intractable seizures who are candidates for surgery are much better off when the surgery is done sooner than later. Wilfong, Angus, M.D. "Seizures and Epilepsy in Children: Initial Treatment and Monitoring." UptoDate. Updated Aug. 26, 2016. What is epilepsy? What are epilepsy medications? What causes epilepsy? What causes seizures? Learn the epilepsy definition, symptoms, and treatment. Read more: Epilepsy & Seizures Quiz: What Causes Seizures? How has epilepsy impacted your life, or the life of your child? Have you or your child ever been injured during a seizure? Please describe your experience. How did your doctor decide whether to recommend surgery for you or your child's epilepsy? How has you or your child's life changed following epilepsy surgery?